We introduce open tests to support iterative test-driven process modelling. Open tests generalise the trace-based tests of Zugal et al. to achieve modularity: whereas a trace-based test passes if a model exhibits a particular trace, an open test passes if a model exhibits a particular trace up to abstraction from additional activities not relevant for the test. This generalisation aligns open tests better with iterative test-driven development: open tests may survive the addition of activities and rules to the model in cases where trace-based tests do not. To reduce overhead in re-running tests, we establishing sufficient conditions for a model update to preserve test outcomes. We introduce open tests in an abstract setting that applies to any process notation with trace semantics, and give our main preservation result in this setting. Finally, we instantiate the general theory for the DCR Graph process notation, obtaining a method for iterative test-driven DCR process modelling. 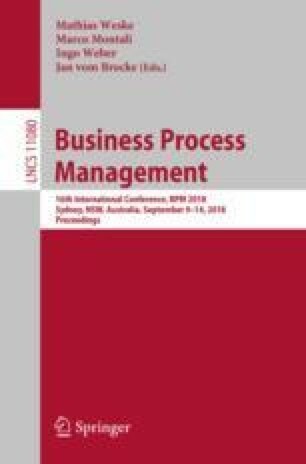 Work supported in part by the Innovation Fund project EcoKnow (7050-00034A); the first author additionally by the Danish Council for Independent Research project Hybrid Business Process Management Technologies (DFF-6111-00337). We are grateful to the reviewers for their help not only to improve the presentation but also to identify interesting areas of future work.